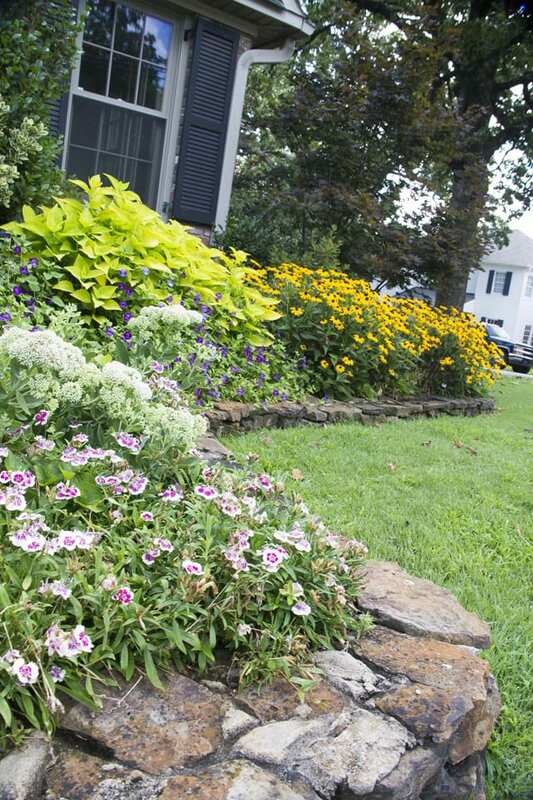 Rock has a place in your landscape, every bit as important as seasonal color and foundation plantings. We tend to get caught up in the bright and shiny aspects of design, and often forget the real heavy lifting of any landscape plan can be done by rock and stone, stacked and laid. 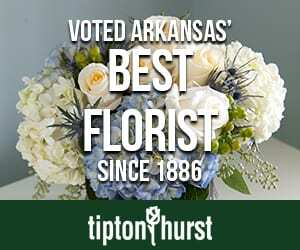 Want a great flowerbed? Don’t forget to outline it. Want a defined walkway? Use flags, instead of concrete. Want a retaining wall? Skip the bricks, and think about boulders. Give your flowerbed a real lift by outlining it in stacked flat stone. Raised beds are better for plantings because of drainage, so there’s a start. And plants cascading, nodding and dipping ever so slightly over a rock edge just seem happier. 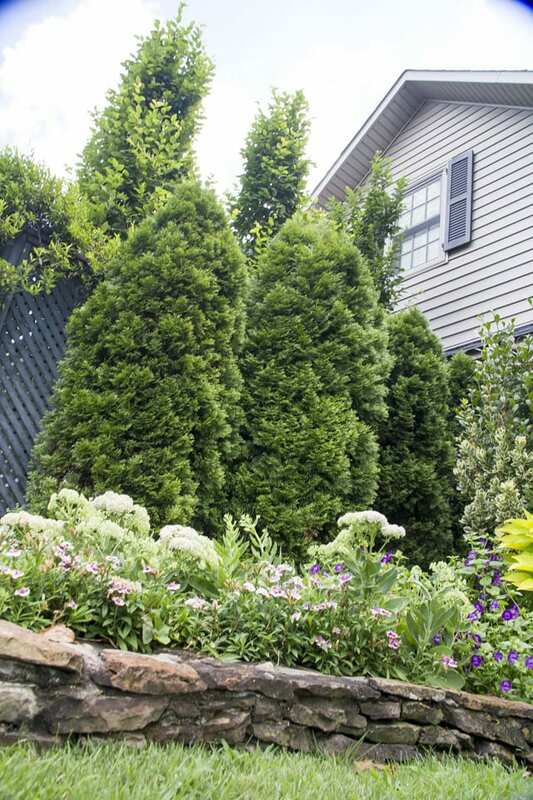 Stacking a small amount of stone also helps keep your border more natural, and less rigid. Let your design follow the rock. You also have a choice: stack your stone naturally, or use cement/mortar to keep them aligned. If you spend the time getting the rock just right for stacking, you find it ‘holds’ well enough without the cement. You just aren’t able to stack it as high, so think about limiting the height to two or three stones. Stone doesn’t just anchor your design, it also adds a touch of permanence and weathering, as if the design were always there. 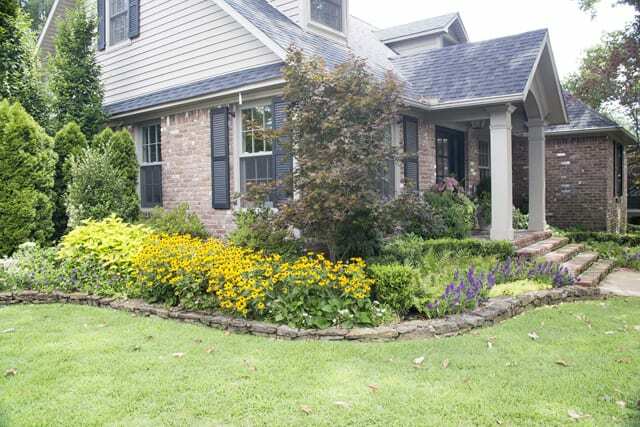 Yes, you want seasonal color and the change that comes with mature plantings, but you also want your landscape to have a sense of timelessness. Think of English pastoral vistas or the stacked stone fences of pre-Revolutionary America. And rock complements your foundation plantings, too. Look how well it works with the cypress at the back of this planting; as if both components had been in place for a long time. If your property has ‘destinations,’ such as lakefront, garage, detached deck, or outbuildings, then you probably want a defined walk. Rather than mixing concrete, think about using flags. 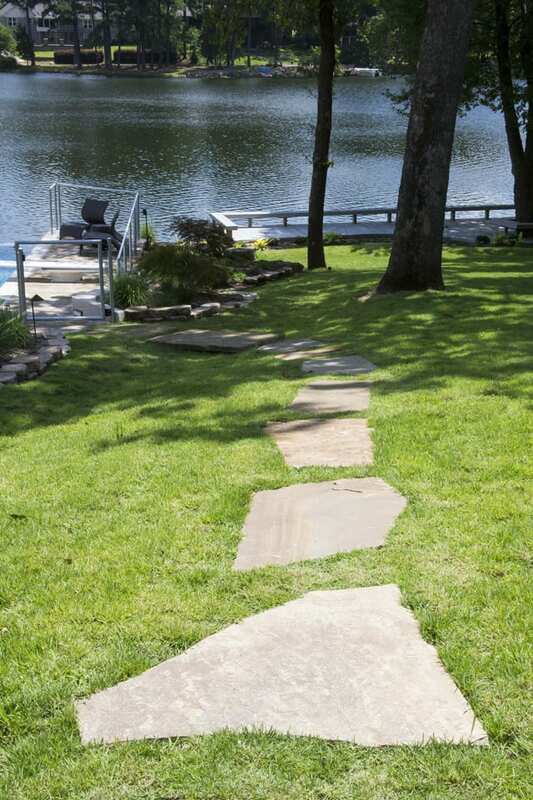 And if you want a wider defined path, just shop for wider flagstone, about 30-36 inches across. Lay it out, create a foundation so each stone is flat and flush with the surrounding area, and let the grass grow around the edge of each irregular piece. The fun in this work is shopping and matching—or contrasting–the flags you want to use. 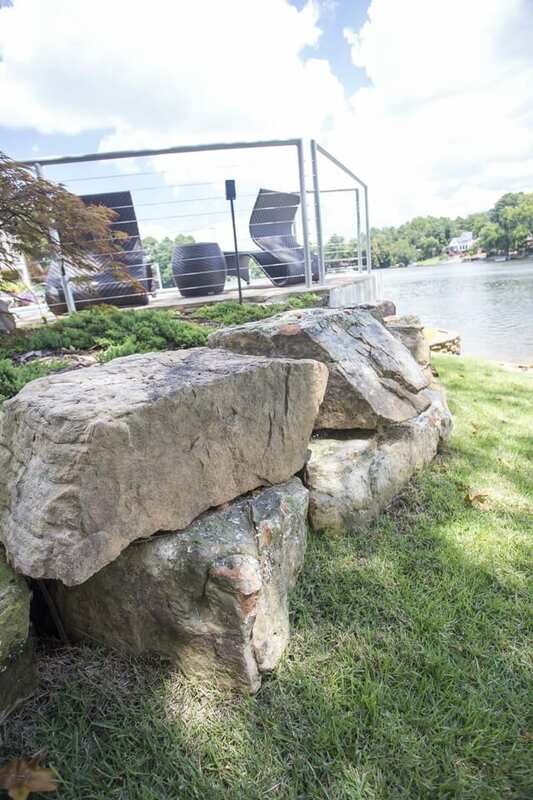 Nothing can be simpler than using larger rock, such as these boulders, as a retaining wall, just like found in nature. Rock is so real and dense, why not use it instead of brick and mortar? And it contrasts with and complements sod, decks, and water in a natural unassuming way. These were chosen for size and stackability. And don’t forget rock is often cheaper than anchor blocks or building a wall. Think about color, scale, dimension, and plants that work with your exposure. But don’t forget the use of rock, as borders, walls, and walks. It’s inexpensive as a rule, and so much more fun to work with that manmade elements. Stone and rock yards can make for interesting excursions when planning any landscape project, and using what you find there will make your design that much more unique. And who doesn’t want that?